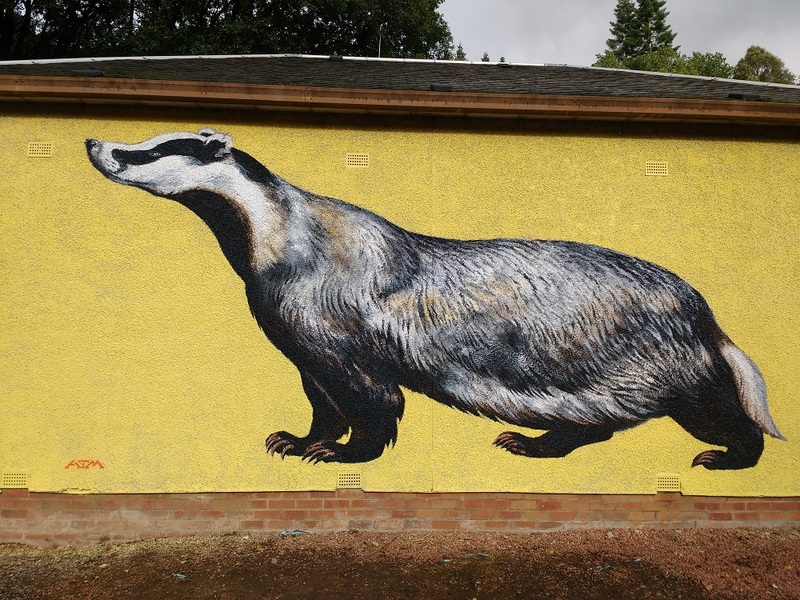 The huge mural of Clyde the Badger was painted over several days by street artist ATM and can be seen on the Clyde Walkway, which leads visitors past stunning waterfalls including the Corra Linn. Clyde can be found lending some unexpected colour to the wall of the substation at Bonnington power station, at the Scottish Wildlife Trust’s Falls of Clyde reserve. Street artist ATM is known for murals of endangered bird species on the walls of urban environments. “I started painting street art of endangered species in 2013. My aim is to show the beauty and significance of these creatures, to make people think about their value and hopefully inspire a change in some of our more thoughtless and damaging practices. “Badgers have rich and complex social lives, and they deserve our respect. As the brutal and misguided badger cull continues in England, I hope this painting will make more people realise their importance. Falls of Clyde Wildlife Reserve is part of the Clyde Valley Woodlands National Nature Reserve. It is famous for its spectacular waterfalls including the Corra Linn, and scenic woodland walks.